WHILE the weather on Sunday wasn't favourable for the second Test match at Bellerive Oval, the visiting parents and children from the Glenora Milo In2CRICKET and Gretna and New Norfolk T20 Blast programs didn't miss out. The children didn't get to go out onto the ground and show off their skills as planned, but they did get a big thrill when Australian team members Nathan Lyon, Jackson Bird and debutant Joe Mennie joined them to answer questions and give every child their autograph. The kids thoroughly enjoyed the events and the efforts of Cricket Tasmania to provide activities for the children despite the weather, was a big well done to Cricket Tasmania for their work with the kids despite the weather was appreciated by all. A day earlier, Lucy Gleeson from Magra officiated as one of the flag bearers who welcomed the Australian and South African players. 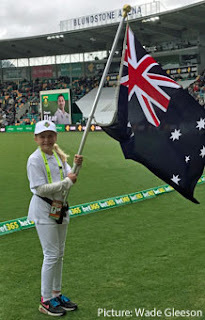 She also had the privilege of leading the Aussies on to the ground before the national anthem ceremonies. Well done Lucy. Congratulations also to Gretna Cricket Club Under 13 player Byron Conley who was recently named the Cricket Tasmania Youth League Player of the Round. During the round two match, Byron picked up two wickets for 11 runs off two overs in the good win over New Town at the Glenora School Oval. For his efforts, Byron won a gift voucher to spend at the Greg Chappell Cricket Centre in Derwent Park. Byron continued his good form the following week against Wellington, taking 4-12 off three overs and scoring five runs. Keep up the good work Byron. The next T20 Blast session is this Friday at Tynwald Park, New Norfolk, starting at 4.30pm and the next Glenora in2CRICKET session is on Sunday at 9am.